The player is dealt an initial two-card hand and adds together the value of their cards. Face cards (kings, queens, and jacks) are counted as ten points. A player and the dealer can count his or her own ace as 1 point or 11 points. All other cards are counted as the numeric value shown on the card. After receiving their initial two cards, players have the option of getting a "hit" (twisting), which is taking an additional card, or not (sticking). In a given round, the player or the dealer wins by having a score of 21 or by having the highest score that is less than 21. Scoring higher than 21 (called "busting" or "going bust") results in a loss. A player may win by having any final score equal to or less than 21 if the dealer busts. 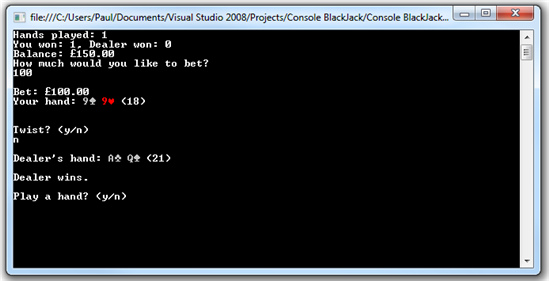 ​First some Variables and a Structure, at Module level, to hold the deck of cards, the values of the cards, and the game statistics. Loop While playAgain.ToLower = "y"
Dim response As String = ""
The shuffle method, randomly shuffles the deck..